It was quite a big jump going from a Moto G (2nd gen, bought in 2015) to a Samsung Note 8 this year, mostly on my dad’s insistence. Here’s how I’ve been working on making the most of my new phone’s capabilities. Camera: Way more pictures of A-, since the camera works decently even in low light. I like how it reminds me to clean the camera lens. Better battery life, quick charge: This is great. I used to keep W-‘s old Moto G handy so that I could swap to it if my phone battery ran low while I wrote in bed. Now I don’t even worry about charging overnight, since I can charge my phone while having breakfast with A-. More storage: It’s nice not having to decide which apps I have space for on my phone. I even used the SD card to copy thousands of archived photos into Google Photos. Pen: Screen-off notes are really quick to scribble down, since all I need to do is take out the pen and start writing. I trust writing more than typing for taking fast notes. I also really like the ability to select part of the screen and extract text, because sometimes apps don’t make it easy to select and copy text. I’ve used the pen to draw and colour illustrations for a book for A-. It’s more awkward than using my tablet PC or the iPad, but it lets me use phone time to get more things done, so it’s worth it. Fingerprint scanner: Surprisingly handy way of reducing the friction of using my phone. I keep my phone locked when the screen is off so that A- doesn’t play with it, and tapping the fingerprint sensor to unlock the phone saves me a bit of fumbling around. Voice and gesture control for pictures: Great for taking pictures, since it’s not easy to hold and shoot with one hand. Speech recognition in general: I’ve been getting the hang of this now that battery life means I’m a little less worried about leaving my phone listening all the time. I have a few shortcuts for tracking activities, and I often set timers and add grocery items by voice too. It’s still not quite reliable, but it’s worth a shot. A- occasionally parrots “Okay Google” and “Command sent,” so I try to model saying “please” when I ask my phone to do things. I haven’t used Bixby as much, since voice wake-up for Bixby interferes with voice control of pictures. Larger screen: This was a little hard to get used to, since the bigger screen makes it hard to put my phone in my pocket or hold in bed. But it does make it a little more manageable to ssh into my server and do things, although working with a virtual keyboard is still annoying. I’ve also used the split screen feature a few times. Edge apps: I’ve used the clipboard and the ruler a few times. Live focus: I’ve used this a few times, but I usually don’t have much time to compose a picture of A-. Maybe when she’s a bit older, or if I think about it more. I want to explore more of the camera’s features, figure out a good workflow for photos, learn more about what I can do with speech recognition, and get better at workflows for notes (thoughts, images, and e-books). I wonder if it makes sense to draw more on my phone than on paper even when A- is around. I haven’t been keen on doing so because she usually wants to imitate me, and she gets more out of drawing on paper than on my phone. Maybe I’ll draw on paper and take quick pictures on my phone instead. I probably won’t upgrade for a while, since it’s likely to be a bit of a hassle selling this phone and upgrading to a new one. I might be tempted by an even better camera in the next phone. After all A- is only this age once. I really like the stylus. That means keeping an eye on the Samsung Note line and figuring out when it makes sense to upgrade. I hope this phone is sturdier than the Samsung Galaxy S3 I experimented with years ago. This one has survived life with a toddler so far, so that’s good. I spend more time on my phone than on my laptop these days, so it’ll be interesting to see how I can make the most of it. My Samsung Galaxy S3 started uncontrollably turning off in February. Even after I cleaned the switches and contacts, it wouldn’t reliably stay on. On W-‘s recommendation, I switched to a Moto G (2nd gen) a few days after my old phone died. I bought the mid-range Android phone from Staples instead of getting it through a phone contract. I was a little nervous about my Moto G’s storage limits (16GB, no external storage), but surprisingly enough, it’s been fine. I subscribe to a handful of podcasts, and I’ve given up on the desire to keep an offline copy of my sketches for easy flipping. I’ve picked a few Evernote notebooks and Dropbox folders to synchronize offline, and I leave the rest for online or desktop use. W- recommended the Otter Commuter case, so I got that too. His is black and mine is purple. Since the phones and cases are identical, sometimes I accidentally pick up his instead of mine if I’m not looking. The case has been working out nicely as well. It’s nice not having to worry so much about dropping my phone (which I’ve done more than a few times) or cracking the screen (which I haven’t). It’s been almost eight months with the phone. I’m happy with the decision to go with the Moto G instead of splurging on a higher-end phone or choosing something more basic. I mostly use it for alarms, activity tracking, reading, mail, calls, weather forecasts, timers, tethering, remote cheque deposits, and the occasional app or game. The recent Android OS update improved the power use. I’ve been okay in terms of battery life – enough to feel comfortable listening to podcasts or leave the pedometer app running in the background. I’ll probably use my phone even more over the next year, so it might be good to think about how I can get even more value out of it. I haven’t quite gotten into the habit of reading e-books on my phone, even though I have the Kindle and Overdrive apps installed. I think it’s a combination of being impatient with the low information-density-per-page-turn of non-fiction books and not building up a fiction backlog instead. I read a bit of fanfiction from time to time. Hmm, maybe I can slowly work my way through classic literature. In terms of podcasts, I like listening to CBC’s Ideas program, and W- and I sometimes chat about the episodes. I also listen to podcasts about philosophy, and Stoicism in particular. I can look around for tech shows, like the one that Daniel Gopar is starting up around Emacs. It would probably be good to take more pictures, too. Sewing, maybe? If I trim my Feedly blog subscriptions a bit more and then add feeds in line with my current interests, that would help me get more out of blog reading. Jotting quick ideas in Evernote worked well before, but I haven’t been doing it lately because I’ve been casually browsing the web instead. Since browsing has diminishing returns, perhaps I’ll shift more attention towards writing. Time to get back to doing flashcards, too! I’ve settled into comfortable routines, but there’s so much I haven’t explored yet. Looking forward to taking advantage of the phone’s capabilities! If you find yourself overcommitted, the “Either ‘Hell Yeah!’ or ‘No’” approach suggested by Derek Sivers (among others) might be a good fit. The idea is that if you rate things on a scale of 1 to 10 (with 10 being awesome), ditch the things that are less than 9 instead of wasting your time and energy. I can see the merits of this approach. Reflecting on it, though, I noticed that I prefer to do things a little differently, and I wanted to dig into the reasons why. When it comes to requests from other people, I’m pretty good at sticking to the “Heck, yeah!” range. After all, whatever I say no to might be a good fit for someone else, or it could be an opportunity to help someone pick up new skills. Besides, if I make few promises, I have more flexibility when it comes to choosing what to work on at the moment. For myself, though, I’m okay with working on things that aren’t an immediate “Heck, yeah!” I think it’s because I see a lot of value in the range of things you would rate from 3 to 8 on that 10-point scale, so it can be good to deliberately carve out time to work in that range instead of spending most of your time at 9 or 10. When I look at the skills and interests that have become big parts of my life, very few of them were instant passions. I’ve always liked reading. I think I fell in love with programming immediately, but I’m not sure because I don’t remember enough about the beginning. On the micro-scale, though, there’s often a little bit of awkwardness and mediocrity when I’m learning something new. I liked personal finance and analytics as soon as I learned about them, but statistics took me longer to wrap my mind around. Most of the things that enrich my life grew slowly. It took me years and years and years to get to the point of enjoying writing, drawing, or cooking. I didn’t look at W- across a crowded room and feel my world come into focus; I got to know him as a friend before growing to love him. Canada made me sad and homesick before it slowly became a second home. Biking was something limited and a little scary before it became freeing. I’m still working on enjoying exercise and picking up DIY skills. Sometimes my goals for learning something burn brightly enough to keep me going, but sometimes I start something trusting that it’s good for me and that I might eventually enjoy it more. It can be difficult getting through the plateau of mediocrity, but it might be worthwhile. I might not often rate deliberate practice and improvement as a 9 or 10 on the excitement scale, either. Sometimes I get impatient or distracted. But it’s good for me too, and it helps me do even better. So I’ll spend time on that, even if I feel a little blah about getting started. Sometimes momentum creates its own energy. Still, it might be interesting to get more of my activities to that “Heck, yeah!” level of energy, when you’re jazzed up about things and you’re in the flow. It’s fun to have those happy-dance-“I rock! I rock! I rock!” moments. How can I amp up the things that I do, moving them up the scale, now that I understand my motives a little better? 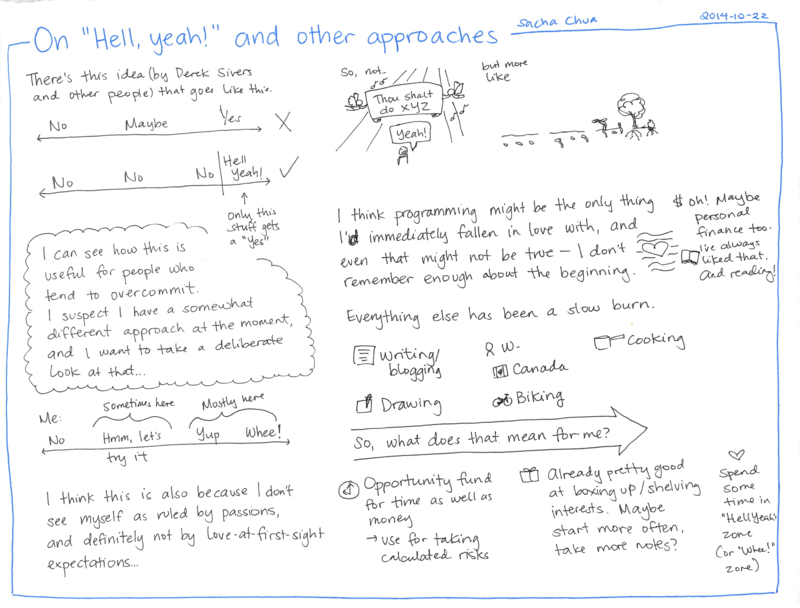 Coding: If I’m coding on my own, I can encourage more “I rock!” moments by coming up with lots of little ideas for personal projects, investing time into improving my workflow, and practising in other ways. Sewing: If my main challenges are patience and skill, maybe I can start with tiny projects and gradually work my way up, learning how to enjoy the process. Exercise: Even small exercises have their own “I rock!” moments, and I can track my progress to enjoy this more. Talking to people: Can I build up a stronger interest in people’s stories and lessons learned? Also, if I accept silences and the occasional awkward bit as normal, that reduces the downsides of conversations. “What tools should I buy?” “What platform do I start with?” “What’s the best option out there?” Geeks have a special case of analysis paralysis at the beginning of things. We try to optimize that first step, and instead end up never getting started. Here’s what I’m learning: In the beginning, you’re unlikely to be able to appreciate the sophisticated differences between tools. Don’t bother spending hours or days or weeks picking the perfect tool for you. Sure, you can do a little bit of research, but then pick one and learn with that first. If you run into the limits, that’s when you can think about upgrading. Food: We start with inexpensive ingredients and work our way up as necessary. Shoes: Upgraded from cheap to medium. Bicycles: Still on the first bicycle I bought in Canada, since it was enough for me. Ukeleles: Glad I just bought the basic one, since it turns out it’s not quite my thing. Knives: Okay, we splurged on this one and started with good knives, since I piggybacked off W-‘s experience and recommendations. Drawing: I tried the Nintendo DS before upgrading to a tablet and then to a tablet PC. For paper, I tried ordinary sketchbooks that cost $4.99 on sale, and have been happy with them so far – although I might downgrade to just having a binder of loose sheets. Don’t worry about what the “best” is until you figure out what your actual needs are. There are situations in which the cheapest or the simplest might not be the best place to start. You can easily get frustrated if something is not well-designed, and some inferior tools like dull kitchen knives are dangerous. That’s a sign that you’ve run into your choice’s limits and can therefore upgrade without worry. Yes, it might waste a little money and time, but you’ll probably waste even more time if you procrastinate choosing (more research! more!) and waste more money if you always buy things that have more capacity than you ultimately need. You can tweak how you make that initial decision–maybe always consider the second-from-the-bottom or something like that–but the important part is getting out there and learning. How do I develop opinions? What is good to develop opinions about? How can I improve this process? I’ve been working on teaching myself design. Good designs and bad designs both take effort to implement, so I might as well focus on good designs. I can read all the usability guidelines I want, but I need an aesthetic sense in order to bring things together into a coherent whole. Hence the need for opinions. Lots of other areas benefit from opinions, too. Opinions can speed up decisions, save time and money, and help me appreciate subtleties. I’d like to form useful opinions while still being open to changing my mind in the face of good arguments or new evidence. I don’t have a lot of strong opinions. I tend to take things as they are, see the value in multiple viewpoints, and not get too attached to things. I can identify and let go of decisions that don’t matter that much to me. In university, I nearly flunked my classes in literature. Art and music are still pretty opaque for me, although I do have a fondness for representational art and self-referential or otherwise punny music. Even when watching movies, I rely on IMDB reviews and TVTropes pages to shape my appreciation of what I’m watching. W-, on the other hand, has a surprising breadth of well-informed opinions about things like kitchen knives, bicycle frames, and other areas. He has had quite a head start, though, so I don’t feel too bad. Anyway, I have a lot of catching up to do. I want to set some parameters on my opinion-forming, however. I want to still be able to enjoy simple things. I don’t want to refine my palate to the point of feeling that I need luxury goods, particularly if this involves artificial distinctions instead of true value. So it’s permissible to develop an opinion about different kinds of lettuce that I can easily grow or get from the supermarket, but I’m not likely to spend several hundred dollars on a brand-name purse. I want to be flexible in my opinions. I should be able to acknowledge situations where the opinion is inapplicable and consider alternatives. I don’t necessarily have to have an original opinion. It’s totally all right to follow other people’s opinions. As much as possible, though, I’d like to be able to articulate the reasons for my opinions (even if I’m choosing someone else’s position). In the beginning, I’ll probably lack the words and self-awareness, but I’ll get there if I keep explaining things to myself. Anything goes. No opinion on these things yet. Do some quick research and pick a recommendation. Go deeper. Compare several approaches. Critically think about them. Pick one approach or synthesize several. Go a little further from the crowd. Come up with my own hypotheses and test them. 1. Anything goes: There are a lot of things I don’t particularly care about. I’m willing to take other people’s recommendations on them or follow my general principles. For example, I don’t have a strong opinion about most of the ingredients we buy from the grocery store, so I usually pick the lowest unit price and then move up from there as needed. Decisions that have low costs (time, money, attention, risk, etc.) generally stay in this category, although I occasionally invest time in thinking about things based on the frequency of the decision. 2. Quick research: I read a lot, and I’m comfortable digging through whatever research I can find online. Many of my decisions are in this category. I do a quick search to see what other people are saying or bring up points from books I’ve read, and we use those ideas when choosing an approach. W- knows a lot about comparison shopping, and I tend to be the one with notes for communication, personal finance, and education. Sometimes I turn these into blog posts as well, especially if I can follow up with the results of applying that opinion. 3. Going deeper: Sometimes research doesn’t turn up a clear answer, or I have to do the work in putting things together myself. I often request several books on the same topic from the library, reading them all over a couple of weeks so that I can see their overlaps and disagreements. Since it’s easy to forget key points and it’s easy to fool yourself into thinking you’ve made sense of something, writing and drawing help me a lot. 4. On my own: Some things are so uncommon, I can’t easily find relevant research. For example, I’m not the only one who’s done some kind of a semi-retirement experiment at an early age, but I don’t think I’ll find any books or online communities that already have reflections on all the questions I have. For topics where I’m on my own, I have to break things down into smaller questions that I might be able to research or test. Then I can write about what I’m learning, come up with ways to experiment, and share my reflections. In terms of process, I tend to form most of my opinions by reading, writing, and trying things out. I rarely talk to other people in order to get their opinions about something, aside from the occasional people-related question where I’m curious about the approaches they’ve used. I don’t debate my opinions since I’m hardly ever interested in arguing with people. There’s no changing other people’s minds, anyway; only presenting approaches and helping them change their mind if they want. Ditto for me – people might disagree with something I write about, but I’m more likely to acknowledge a difference in opinion than to change my mind unless I really want to. So, what do I want to get better at forming opinions about? I’ve already mentioned design as one of the areas I plan to focus on. Philosophy is another: forming opinions about how I want to live and what I will do. Developing opinions on exercise will involve trying things out and paying close attention to how I feel. I could probably work on my opinions about business, too. Reflection might turn up more opportunities that are in line with my current interests. In terms of tech, I can become more opinionated about good programming practices, patterns, and frameworks. Some consumer things are probably worth developing more opinions about because of their cost or frequency in my life. It may be good to develop an opinion about bicycling. Cooking is a good area for opinions, since it’s all a matter of taste anyway. I can learn more techniques, get better at those techniques, and try different recipes. It might be good to develop opinions about gardening (particular cultivars? gardening practices? ), although I’d probably need to develop the skills and infrastructure to start plants from seed first. Maybe start with salad green types? That’ll have a faster growth cycle, and I can also test things by buying different kinds of greens from the market. Do I want to continue with my current process? Are there ways I can improve it? One easy step for improving my opinion-building process is to capture more of it as blog posts. If I write about opinions as I’m forming them, I benefit from the explanation and the review. Other people might be able to share tips, questions, or ideas. There are lots of little opinions and opinions-in-progress that I haven’t shared on my blog yet. It could just be a matter of making blogging even more a part of my thinking process. I can experiment with talking to more people while I’m forming opinions. I should probably be careful with that, though, since advice is a funny thing. It might be interesting to be more explicit about the assumptions and hypotheses related to my opinions. Hmm… Is this something you’ve thought about? How have you improved your opinion-forming processes? Every so often, I spend time thinking about what I want to focus on. I’m interested in many things. I like following my interests. Guiding them to focus on two or three key areas helps me avoid feeling split apart or frazzled. I balance this thinking with the time I spend actually doing things. It’s easy to spend so much time thinking about what you want to do that you don’t end up doing it. It’s easy to spend so much time doing things that you don’t end up asking if you’re doing the right things. I probably spend slightly more time on the thinking side than I could, but that will work itself out over time. I balance thinking with moving forward. It doesn’t matter if I might be going in the wrong direction, because movement itself teaches you something. You discover your preferences: more of this, less of that. You get feedback from the world. For me, moving forward involves learning more about technology, trying experiments, making things, and so on. Taking small steps helps me avoid spending lots of time going in the wrong direction. What do I want to do with my time? Fitness: The weather’s warming up, so: more biking, more raking, more compost-turning, more carrying water to the garden. It would be good to be fitter and to feel fitter. I like the focus on fitness rather than exercise – not exertion for its own sake, but practical application. Coding: I like coding. Coding might be a perfectly acceptable answer to the question “What do I want to do with my life?”, at least currently. I’ve been doing a lot more Emacs coding, and I’m digging into other technologies as well. I like it because I can build stuff – and more importantly, learning helps me imagine useful stuff to build. I think I want to get better at making web tools that are useful and that look good, but I’m not sure. Lots of other people can do this, and I haven’t come up with strong ideas that need this. (Back to the need for a well-trained imagination!) I can wait to develop this skill until I have a stronger idea, or I can learn these skills to lay the foundation for coming up with ideas. I’ve been thinking about getting better at working with APIs, but that’s even more like digital sharecropping than creating content on other people’s platform is. APIs, pricing models, and all sorts of other things change a lot. I’m wary of investing lots of time in things that I have very little control over. What would a few possible futures look like? I could be a toolmaker, building lots of little tools for niche audiences. technomancy and johnw are great role models for this. I could be a contributor or maintainer, building up part of something like Org or Emacs, or perhaps one of the modern Web stacks. If I need to keep a path back into the workforce, maybe back-end development would be a good way to do that. I like talking to fellow geeks anyway, so it’s okay if I don’t focus on front end–that way I won’t have to deal with fiddly browser differences or client tweaks. Writing: Writing helps me learn more and understand things better. It saves other people time and tickles their brains. It’s also a great use of my time, although sometimes I feel like coding has more straightforward value. Lots of people write. I want to write about things things that are not already thoroughly covered elsewhere. I want to be myself, not some generic blogger – to write (and draw!) things that are geeky and approachable. I like writing about Emacs (goodness knows how we need more documentation! ), self-tracking, experiments, technology, and learning. What’s on the backburner for now, then? Sketchnoting other people’s content: Useful and easy to appreciate, but potentially distracting from the other stuff I want to do. I may make an exception for books, since I like reading anyway. Spreading sketchnoting: I can leave this in the capable hands of Mike Rohde, Sunni Brown, and Dan Roam. I’ll still use sketchnoting to think through things, though, and I’ll share them on my blog and on Flickr. Spreading alternative lifestyles (semi-retirement, portfolio careers, etc. ): Jeff Goins, Pamela Slim, and Mr. Money Mustache are doing fine with this. I tend to stay away from giving advice, and I don’t want to inadvertently feed wantrepreneurship as a substitute for actually taking action. I’ll still write about my experiments and decisions, though. Drawing better: I draw well enough for my purposes, and I want to keep things approachable. What does this reflection teach me about what drives me? I like the feeling of figuring things out and of contributing to something that will build over time. I like positive feedback, but I can move away from it if I want. For example, people always ask me about sketchnotes, but I like Emacs stuff more even though it’s hard to explain in regular conversation. If I don’t have a particularly strong idea for something I want to build, I can spend the time learning more about the capabilities of the tools I use. Along the way, I’m sure to run into lots of small gaps. I can fill those in to demonstrate my learning. I tend to build things for my own convenience. I open it up if I think a web interface will be handy, and if other people find it helpful, that’s icing on the cake.